If you’re looking for an unbreakable bike lock, then I’ve got some bad news. Unfortunately, no bike lock is unbreakable. But if you’re looking for the very strongest bike lock available today, you’ve come the right place! Keep reading and I’ll introduce you to the most secure bike locks money can buy. But first a quick explanation. 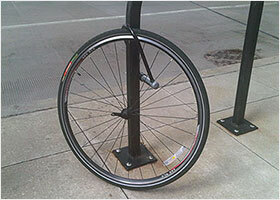 Every bike lock can be defeated if a thief has the right tools and enough time. The strongest bike locks just need more advanced tools and more time to break. So when you buy the most secure bike lock you’re just reducing the number of thieves who’ll have the tools and the time to steal your bike. It’s also worth noting that the strongest bike lock doesn’t necessarily mean the best bike lock for you. As we’ll see: with great strength comes great compromise! The more secure a bike lock is, the heavier and less practical it is. Not to mention more expensive. This accolade goes to the Kryptonite New York Fahgettaboudit Mini. It is without doubt the most secure portable bike lock available today. Some might say it’s the strongest bike lock full stop. With a 18 mm shackle, it’s completely bolt-cutter proof. The only way this shackle can be cut is with an angle grinder. And because it’s made from a super high quality MAX performance steel, it will take longer than any other bike lock. And don’t forget: it’s double bolted (locking on both sides of the shackle), so it needs to be cut twice to open it up! Also, because it’s a mini u-lock, once you’ve locked your bike up (as long as you’ve done it properly), there shouldn’t be any space inside the U shape which could be exploited in leverage attacks or filled with a small hydraulic bottle jack. So it should be virtually immune to these tactics which are commonly used on bigger u-locks. This extraordinarily high level of security is reflected in the ratings from the independent lock testers. Not only does it get Sold Secure Bicycle Gold. It also gets Sold Secure Motorcycle Gold which requires a higher level of security again. And it also gets 4/5 stars from ART. But all this security does mean compromises elsewhere. It’s very heavy, weighing 4.55 lb (2.06 kg), which is about the same as 5.5 cans of coke. So carrying it around everyday could be an issue. And it’s small size means you won’t have loads of options when our looking for somewhere to lock your bike. However, if you’re high risk: this is a fantastic bike lock. Incredibly secure, it’s as close to unbreakable as you’ll get. And it achieves this while still being portable. All in all: the best choice if you need the very strongest portable bike lock. The Abus Granit X-Plus 54 Mini is the smaller version of the ever popular Abus GRANIT X Plus 540, which I think is the best all round bike lock available today. Also known as the San Francisco Lock because it was specifically designed to fit around the city’s reinforced parking meters, the 54 Mini is often overlooked when considering the very highest security bike locks. The shackle is only 13 mm thick. But it’s made from a very strong steel in a special parabolic shape that makes it immune to bolt cutter attacks. Just like the Fahgettaboudit it’s double bolted and it’s small size means it’s very unlikely it could be defeated by hydraulic jack or a leverage attacks. This level of protection is reflected in it’s security ratings. 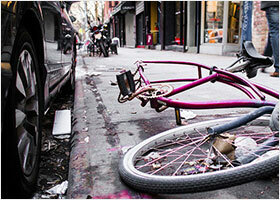 Like the Fahgettaboudit, it’s been awarded both Sold Secure Bicycle Gold and Motorcycle Gold. And it has a 3/5 star rating from ART. So nearly but not quite as secure as the Fahgettaboudit. Where it resolutely beats the Fahgettaboudit is in weight. At 2.56 lb (1.16 kg) it’s almost half as heavy as the Kryptonite lock. That’s a much more manageable 3 cans of coke! 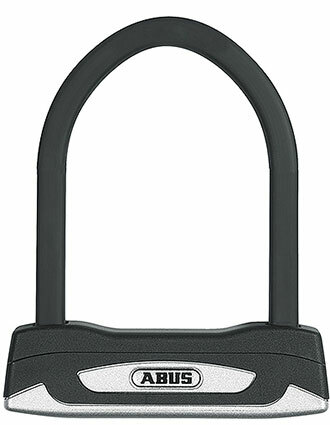 For me, the weight advantage of the Abus beats the security advantage of the Kryptonite, and if they are more or less the same price I would tend to go for the Abus. But that’s a choice you will make yourself based on your own priorities! The Kryptonite New York Standard isn’t quite the standard sized version of the Fahgettaboudit. (That would be the New York M18-WL which I’m excluding here because it’s really a motorcycle lock). But in terms of security it’s the closest a standard sized bicycle u-lock gets to the Fahgettaboudit. It “only” has a 16 mm shackle compared to the 18 mm shackle on the Fahgettaboudit. But it’s still Sold Secure Bicycle Gold and gets 4/5 stars from ART. And even though the bigger size will give you loads more places to lock your bike, it’s still lighter than the Fahgettaboudit. So you win twice! Weighing 4.35 lb (1.97 kg), of course it’s still very heavy (around the same as 5 cans of Coke). But you won’t find another standard sized u-lock offering this kind of security that’s any lighter. So, if you want the very highest level of protection without sacrificing the number of places you’ll be able to lock your bike, the New York Standard is a great choice. The OnGuard Brute Mini is a smaller u-lock just like the Fahgettaboudit. It’s double bolted and with a shackle that’s 16.8 mm thick, it’s also completely bolt cutter proof. And while it’s not quite as secure as the Fahgettaboudit, you can usually find it at a much cheaper price. It’s not actually rated by Sold Secure or ART. But since it’s essentially the smaller version of the Sold Secure Gold rated OnGuard Brute STD (and has the same in-house security rating), we can safely assume it offers the same level of protection and I feel very confident recommending it here. Again it’s significantly lighter than the Fahgettaboudit, weighing 3.06 lb (1.39 kg), which is about the same as 3.5 cans of Coke. So it may be a little more practical as well. OnGuard locks sometimes have a reputation for poor reliability but as long as you clean and lubricate it now and again (using this guide as a reference), you should be OK.
All in all this is a very strong lock. 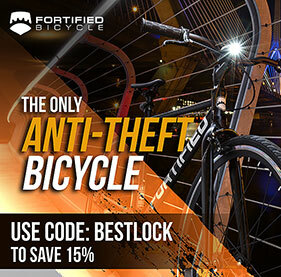 And since it’s usually available at a much lower price than other similar locks, I’d say it was the best value high security bike lock around. 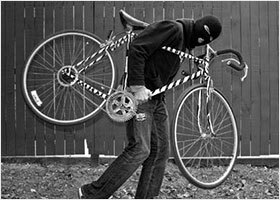 Since over 50% of stolen bikes are taken from the owner’s home, how you secure your bike in your garden, shed or garage is really, really important. Since you don’t have to worry about carrying your lock around, in these situations chain locks are generally the best option. Why? Well, the very strongest chain locks are immune to certain types of attacks that can defeat even very strong u-locks. For instance hydraulic bottle jacks and leverage attacks can’t really be used on a chain. So the very strongest chains are more secure than the very strongest u-locks. Chains are also more practical at home. Their relative length means you can use one chain to secure two or more bikes. And they’re much more suited to use with ground anchors, shed shackles and the other immovable objects you’re likely to be securing your bike to at home. But as we already know: stronger bike locks are heavier bike locks. That’s just the way it is. And since chain locks are always heavier than u-locks, the strongest chains are really, really heavy! Of course this won’t matter if you’re just using them at home. But just to be clear: these super strong chain locks are not for carrying around on your bike! If you’re in the UK then the very strongest chain locks come from two independent companies Almax and Pragmasis. 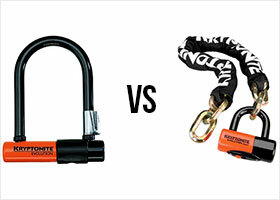 Both offer chains with 16 mm links that are guaranteed to be bolt cropper proof. No, they can’t be cropped even by the biggest and strongest 42″ croppers. This means that the only way a thief is getting through these chains is with an angle grinder. And that would take a fair amount of time and would obviously make a fair bit of noise! Both chains comes in a range of lengths with the well regarded Squire SS65CS Stronghold lock which has a 13 mm shackle that can’t be cropped either since the way it closes protects it from attack. And of course, both chains are Sold Secure Bicycle Gold and Motorcycle Gold. Which to choose? In terms of security they’re both about the same. They’re the very strongest bicycle chain locks you can buy. (Both companies offer even more secure, 19 mm chains but these are so heavy they might actually damage your bike, so are not recommended for bicycles). The Almax chain is ever so slightly cheaper. I have read somewhere that the Almax customer service is not quite as good as that from Pragmasis but I couldn’t confirm this as I’ve not dealt directly with either company. But whichever you chose, you’ll be getting the very strongest bike lock available today and you’ll no doubt be able to sleep much better at night! If you’re in the US then you won’t be able to get the Almax or Pragmasis chains. In which case, the next best thing is the Kryptonite New York Legend chain. 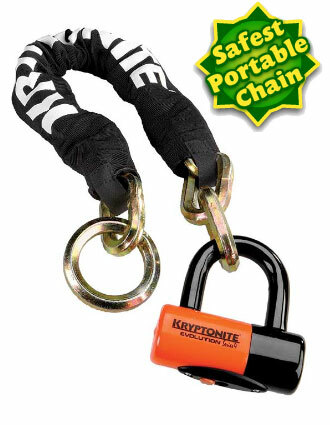 This is Kryptonite’s most secure lock: a chain with 15 mm thick links is secured by a padlock with a 16 mm shrouded shackle. While Kryptonite don’t guarantee it can’t be bolt cropped, it would take a very skilled (not to mention big and heavy) thief to get through this chain. I’ve certainly never heard of it being defeated by bolt croppers. That it’s Kryptonite’s strongest lock is reflected in the security ratings. Sold Secure award it Bicycle Gold and Motorcycle Gold. While ART give it 5/5 stars. And Kryptonite themselves give it a full 10/10! It’s available in two lengths: 35.5” (90 cm) and 60.0” (150 cm). The shorter chain weighs 9.50 lb (4.31 kg) which is the same as 11 cans of coke. The longest weighs 15.95 lb (7.23 kg) which is about the same as 18.5 cans of coke. As I said, these are not locks to carry around on your bicycle! However, if you’re looking for the very strongest lock available to keep your bike safe at home: this is a fantastic choice. While in most cases u-locks are the best choice for portable security and chain locks are best for stationary security, there may be circumstances where you’d prefer to use a chain lock out in the street. For example, maybe you find wrapping a chain round your seat post easier than dealing with flaky u-lock frame mounts. Or maybe you need the greater locking options a longer chain gives you. In both of these cases, I’d usually suggest you look at folding locks before chain locks. But even the most secure folding locks aren’t as strong as the best chains. And maybe you want to use one lock to secure your bike both at home and out in the street. In which case a really secure chain lock could be a good choice. The problem with chains is that to be portable they need to be thinner. And as chains become thinner they become more vulnerable to bolt croppers. So, unlike u-locks there are no portable chains that can’t be bolt cropped. However, a thick chain of high quality, hardened steel and a good locking technique that keeps the chain off the ground can make it very unlikely that anyone will be able to bolt crop your lock out in the street. So the strongest portable chain lock is simply the thickest chain that’s still light enough to carry around on your bike every day. And for me that’s the Kryptonite New York Noose. This lock features a chain with 12 mm thick links and a disc lock with a 14 mm shackle. While both can theoretically be bolt cropped, if you keep the lock off the ground you can make this almost impossible. And since Sold Secure award it Bicycle Gold and ART give it 4/5 stars you can rest assured this is a very secure bike lock indeed. Now usually a 12 mm chain that’s long enough to be practical would be prohibitively heavy. Far too heavy to carry around on your bike every day. But since this lock uses a noose system that almost doubles the usable length of the chain, it can be shorter and therefore lighter while still remaining practical. I explain how this system works in my full review here. Don’t think that this means the New York Noose is light! It’s available in two lengths 30.0” (75 cm) and 51.0” (130 cm). Only the shorter length is light enough to be portable. And even then it weighs 6.95 lb (3.15 kg) which is the same as 8 cans of Coke and makes it significantly heavier than even the Fahgettaboudit! So there needs to be a good reason to choose a chain lock over a u-lock. But if that choice makes sense to you then this is the strongest portable chain lock available and a really great lock for high risk areas. So these are the very strongest bike locks. They’re not unbreakable. Whatever anyone tells you: no bike lock is unbreakable. But they’re as close as you’ll get. Don’t forget that this security comes at a price. The strongest locks are often small, heavy or expensive. Some of them are all three! But if you ride a desirable, high value bike in a high risk area then you need a super secure bike lock and these are the best you can buy. With one of these locks and good locking technique you’ll know you’ve done the most you could possibly do to protect your bike. If you’re not sure, I suggest you read my complete guide to finding the best bike lock for you. This will show you the 3 simple steps that guarantee you find a lock that both adequately protects your bike and is practical and painless for you to use every day. Yes you’re right John! I’d seen that and meant to update the article. I think just a few years ago portable grinders didn’t have such good batteries. But they clearly do now!